While accelerating from a stoplight recently in my ‘01 GMC Sierra (4.8L 4l60e RCSB), I felt a slight surging and loss of power. Neither pressing the gas pedal nor letting off helped. I figured the truck started misfiring or something simple and I could just limp the 3 miles home. The surging/power loss lasted for about 3/4 mile then the truck finally gave up the ghost. After coasting safely to a side road (with flashers on, no trench coat jokes, please), I tried cranking it several times but to no avail. With approximately 125K, I immediately suspected something beyond the notorious fuel pump issues these trucks have as I thought it was replaced around 30K ago. While sitting in the cool autumn rain, with the rhythmic metronome of hazard flashers fading in and out of my consciousness, I started going through my mental trouble tree. Fuel? Not sure if it’s getting that. Air? Yes, seems to be, unless the IAT is occluding the intake for some reason. Spark? I’d have to assume at least one of the eight cylinders is getting spark. Mice? Maybe they burrowed a little nest in the wiring harness and one of the wires finally chaffed enough to cause it to stall? After several futile attempts to prod around the engine, locating various sensors (IAT, TPS, CTS and others) and returning to the cab to crank and crank without success, I conceded defeat and called AAA. This indeed was something more complex than I am going to diagnose or fix on the side of that road with only my pocket knife and lip balm. My inner MacGyver can indeed save the day sometimes, but a 1986 Chevy flat bed with a 427 was the temporary resolution in this case. Upon depositing the truck at a ***-eyed angle in my driveway, I thanked and tipped the tow truck driver and proceeded to once again turn the key. Why is it than when faced with a non working device, we try the same thing again expecting a different result? Maybe it’s a male trait. DVD not loading into the player? Load it again. And again. GPS device not powering up? Try the switch 37 times. Still not working? Yell at the device and berate the intelligence of the engineers who designed both it and the 14 satellites required to triangulate your exact position. Then connect power to the device in and start all over again. Needless to say, I did not experience a different result this time. Starting afresh the next morning, I consulted ChiltonPRO for diagnosis and repair procedures. I decided to pull the codes stored in the computer, which proved to be less of a smoking gun than I had anticipated. But they did lead me on a path of diagnosis and helped eliminate certain factors. Working from the “parts dartboard” approach can result in a tremendous waste of resources (time, money, dead-end paths, ancillary components broken, etc.). Our friend the ECU yielded P0171 and P0174, both fuel trim codes, indicating a potential lean condition. So I am on the path of fuel issues… or something causing fuel issues. Working from the obvious (and self-admitted easiest item to replace), I thought maybe the fuel pressure regulator had decided to stop working. I applied some vacuum to it and low and behold, the engine did crank and idle briefly. So I went to the parts store and replaced the FPR. While inspecting the old one, I saw a small rip in the diaphragm. But idling briefly is not what I would call a raving success. At this point, I really had to rule out the fuel pump and the easiest way for me to accomplish that was with the aid of a fuel pressure gauge. I plugged it into the port on the right side of the fuel rail and sure enough, no pressure with key off, none with key on, none while cranking. The pump was not calling it’s audible on the field, either. I like easy things and have a tendency to be lazy. As such, I swapped the DRL and fuel pump relay just to see if I could avoid getting at the fuel pump for further diagnosis and potential repair. No such luck. To further evaluate the conditions at the pump, I had two options: drop the tank or remove the bed. Since I had just filled the tank yesterday, dropping the tank was not an option. Compressor gets turned on, engine hoist gets wheeled out, impact gun and sockets at the ready, earplugs inserted and away we go. In GMs infinite wisdom or sympathy for technicians, removing the bed on these trucks involves three easy steps. 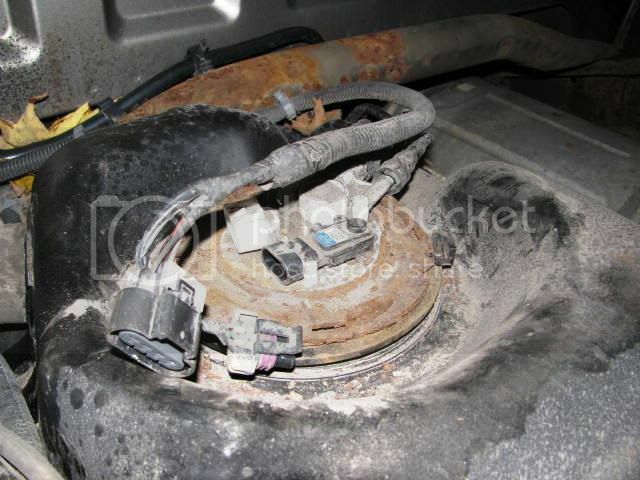 First, unplug all electrical connections at a convenient junction block under the rear bumper. Second, remove the fuel filler neck bolts and gas cap. Third, unzip eight bed bolts, all with reasonably easy access. And voila! The bed is just sitting on the frame. How one removes the bed from the truck depends entirely to one’s circumstances. Three buddies with strong backs works well. So does an engine hoist. I prefer the latter due to the high instant-gratification factor. Securing the hoist to the bed with chains is usually easier than plying several friends with beer and the remote promise of Zen-like satisfaction when the job is done. Save for one stubborn bolt in the right rear decided not to play nicely, the bed came right off without issue. The solution was to torch the head off and Vice-Grip the body. I’m on a roll! Now where is that GPS device again? While testing the pump, I found that it is indeed getting power with key on and cranking. So bad pump. Very bad pump. Look what you did! Another bonus victory exposed in this step was that the wiring harness has already been upgraded to the flat four style. The next step is to get a pump and replace. Before acquiring the new fuel pump, I decided to check with the local selling dealer who had serviced the truck in the past. The Service Manager said they replaced the sending unit in April, 2007 but not pump. Why only the sending unit? I have no idea why, with these pumps having a known issue at around 100K and this truck having 95K at that time, they would not replace the pump as overlap and a moderate additional parts cost. That's like rebuilding the engine and reusing main bearings. I can only imagine the conversation between the Technician and Management at the time, the Tech knowing full well failure is right around the corner for the fuel pump. With the new pump in hand, I followed all appropriate safety steps to R&R the pump, a relatively quick job with the bed off. Rust had certainly pervaded the retaining ring and required special attention with penetrating fluid to prevent damage. After the new pump was installed, I cranked and the vehicle caught immediately. The pump was happily making its quiet familiar high-pitched whine while the truck was idling away. Ahhh, 1–8–7–2–6–5–4–3. What a comforting symphony of mechanical harmony. Is your Corolla carbureted or fuel-injected? Its a fuel injected sir...Sorry i failed to response immediately. I bring my corolla in a mechanic shop owned by my friends fiancée yesterday. i already bought and replace my inline fuel filter. Thanks mate!